I had hoped I would never have to write a post like this. But I do. I have recently found someone rather blatantly copying my personalised designs. I cannot explain how upsetting this has been, particularly due to the nature of the copying. Not just any "someone", by the way. A customer. Someone who had purchased designs very regularly from me for 16 months until March of this year. I'm not going to name her - I'm better than that. But I will show you what she did. You all know my personalised range. It's pretty recognisable as mine - anywhere you see it. There are clear copyright notices on each and every one of my designs up on Spoonflower, and on my website. I simply cannot understand why my customer would think it was ok to take my Intellectual Property and make it her own, but she did - reproducing my designs and having them printed herself. These personalised designs are not automatically generated...they are created by me, by hand. More puzzling to me is how she thought I would not find out...when she quite happily kept promoting my designs (and her copied designs) on her page. Here is a side by side comparison I did...mine on the left - the copy on the right. There is no mistaking the similarity is there? 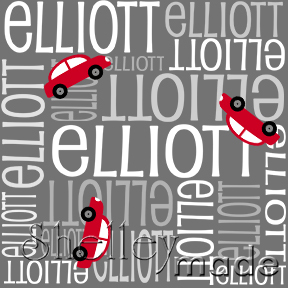 This is another example of my designs...an actual Elliott I created a few months back for a customer. To add insult - the copyright infringer downloaded clip art and added it to my design layout. I do not use clipart. At all. Everything I put on my designs is mine, hand-drawn by me. Where I use a font - I have either written permission from the author, a purchased license for commercial use, or it is a free for commercial use font. I take pride in that. None of the following are my designs...although they sure look like them. These photos are all taken from the location to where my ex-customer publishes and sells her products. I am publishing them here, with her identifying marks removed, so that you can see the extent of the violation - and why I was understandably so upset. I thank all of my loyal customers for their support. There are a number of those customers that sell items made with my designs entirely legitimately - and with my absolute backing. Just not the customer whose photos appear above. I take the protection of my Intellectual Property very seriously, and have issued the appropriate documentation to prevent this person from printing any more copied designs. I hope that person does come across this post, and understands the absolute hurt and upset she has caused for me. Shame on you. It's just plain and simple stealing.